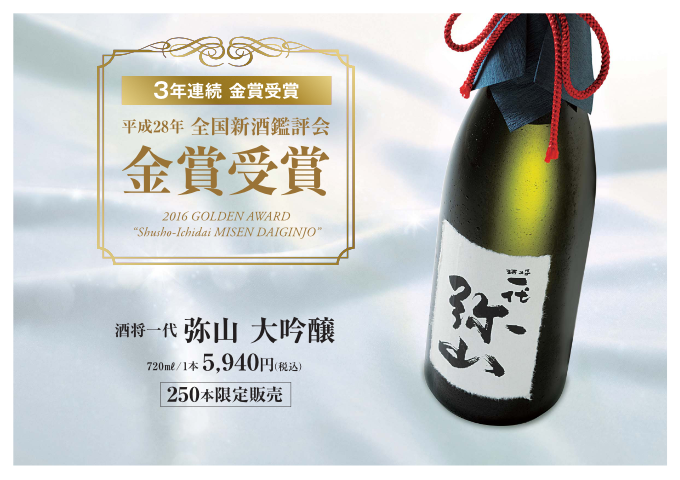 In 2016 Japan “Annual Japan Sake Awards” held by National Research Institute Brewing, “Ichidai Misen” Daiginjo (very special brew) won the Gold Prize, for the third years continuously. Only limited 250 bottles were sold in Japan. The luxurious aftertaste of Pear and Pineapple comes together with Mascat. The heart flavor and smooth aftertaste keep long in your mouth. Have a taste of “Ichidai Misen” Daiginjo (very special brew) with your friends!